Hurt McDermott’s poetic examination of a failed magic act, headed by the aging magician Prospero and his rebellious assistant Calibana, delves deeply into the murky psychologies of failure, fantasy, and control. The evening’s performance proves to be their last, as the characters’ recounted regrets sever any last ties to one another, or to the art of illusion itself. Longtime professional magician’s assistant Sheryl Mitchell was contracted as the production’s magic consultant. Significant rehearsal hours were spent training both Wilson and Sledd for the various tricks required by the script, and a customized sawing-in-half box was designed and constructed by D13’s set and carpentry teams. 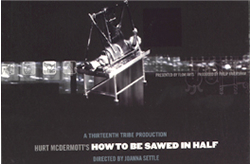 How to be Sawed in Half was presented as a site-specific work in the Athenaeum mainstage, a vacuous, aging touring house in central Chicago replete with faded velvet curtains and crumbling plaster reliefs. On the stage’s yawning expanse, Prospero and Calibana ran their show from a mini-proscenium with glittering curtains, a stage within the stage. Even under sell out conditions, this “little” magic act seemed to have only a smattering of audience, a testament to the loneliness of the text and its characters. Voids of space existed between character and character, characters and audience, audience and audience. A small band of professional musicians, headed by D13 Artistic Associate Mark Messing, performed original compositions live from an audience box suspended over the audience’s heads. Playful, wistful, and often interactive, this unique accompaniment (a virtually continuous score) added an invaluable dimension to the production. In one particularly memorable sequence, a white rabbit was pulled from a hat, and 20 large black hares flooded onto the stage. The rabbits remained, wandering the large empty stage, for the rest of the evening. As if fed by darker instincts, Prospero and Calibana hypnotized each other amongst the hares to get some time alone with their thoughts. This production marked the first time live animals were housed in residence at the Athenaeum Theatre.